Capital Entrepreneurs Week Starts Today! Capital Entrepreneurs Week kicks off today and runs through May 6. Capital Entrepreneurs Week brings two of the premiere startup events in the world to Madison – Startup Weekend and 3 Day Startup. The week-and-a-half of entrepreneurship and startup focused events includes speakers, sessions, and more. The burgeoning Madison startup scene has seen a lot of success, and Capital Entrepreneurs Week will showcase much of this energy. Supporting organizations and partners for the week include Capital Entrepreneurs, Sector67, Accelerate Madison, City of Madison, University of Wisconsin, Edgewood College, Madison College, Young Entrepreneur Council, Wisconsin Economic Development Corporation, and VETransfer. Full details for the week are available here. CE member Spill took home first place and $25,000 at the Global Social Venture Competition (GSVC) at the Haas School of Business at UC Berkeley. Spill was chosen from an initial pool of more than 600 entries to GSVC in a record 50 countries. More information on the competition is available here. CE member Sconnie Nation has launched the latest addition to the Sconnie brand: beer. Kegs of Sconnie Beer rolled out to multiple downtown Madison bars last week, and 16-ounce cans will also be available at a later date. 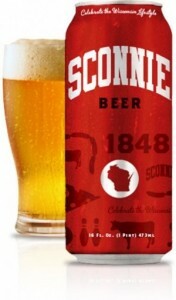 Sconnie Beer is an American lager similar to Miller High Life or PBR. CE member Vidmaker recently demoed their cloud video editing platform at the debut of the first class from TechStars newest accelerator located in San Antonio. Vidmaker joins CE companies SPILL and Murfie as past and present TechStars participants. Read more about the TechStars demo day here. â€œThe Entrustet service allows people to quickly, easily and securely prepare the last wishes for their digital assets and is a complement to SecureSafeâ€™s existing data inheritance features. By consolidating the two companies, SecureSafe (formerly known as DataInherit) becomes the premier service for offering high security data storage both now and for the future,â€ Schwarzer said. Entrustet, cofounded by Jesse Davis and Nathan Lustig, was a founding member of Capital Entrepreneurs back in May 2009 just after Davis and Lustig graduated from UW.Â The deal also received coverage from The Economist in an article called Deathless Data. Entrustet is the second CE company to be acquired out of the original founding companies. Â It shows that Madison is continuing to develop into a great place to start a startup. CE alumni Andrew Ferenci, Corey Capasso, and Dan Reich will be telling the story of their social commerce and analytics startup Spinback Tuesday, April 10. Andrew (entrepreneurship), Corey (entrepreneurship), and Dan (computer science) each had their own CE company in Madison, then moved to New York City where they started Spinback which was sold to Buddy Media after turning down investments from several distinguished investment firms. The Wisconsin Technology Council in partnership with the Wisconsin Economic Development Corp has put together the Wisconsin Entrepreneurs’ Toolkit designed to introduce entrepreneurs to the many resources available to them. Wisconsin has become more well known as a great environment for startups (especially Madison in particular) over the last few years. This Toolkit offers a great introduction to the entrepreneurial ecosystem and is a great guide for new entrepreneurs. Are you an entrepreneur in the Madison area? Let us know – Capital Entrepreneurs is here to help you. The full Toolkit is available here. CE founding member PerBlue launched their latest mobile game today. The deep, location-based RPG titled Parallel Mafia is the first major addition to PerBlue’s family of “Parallel” games since 2008. Parallel Mafia joins the successful Parallel Kingdom, which now has over 1 million players worldwide. Set in a futuristic and crime-ridden world, Parallel Mafia players battle chaos and corruption to conquer their real world location. By completing jobs and claiming territory, mobsters gain influence and rise through the ranks to become a Mafia Boss. These mafiosos arm themselves with cyborg technologies and attempt to spread their influence, all while avoiding the heat of the menacing Apex Agency. Check out the official press release and additional media coverage here. We’ve got an action packed week of events coming your way! We’re bringing two of the premiere startup events in the world to Madison, along with multiple other startup focused events, and it’s all happening April 25 – May 6, 2012. Capital Entrepreneurs Week is anchored by Startup Weekend and 3 Day Startup. The events are happening back-to-back weekends, each with a goal of getting people to work on projects and form real companies – all over a weekend. Supporting sponsors for these events include Google, Qualcomm, Epic, Earth IT, and Neider & Boucher. Organizing partners include UW, MATC, Edgewood College, Capital Entrepreneurs, and Sector67. Great prizes are available, and more importantly, participants are in for a great experience. Have an idea you want to bring to life? Want to be involved in working on an awesome project? Register now for Startup Weekend (3 Day Startup registration has closed). More Capital Entrepreneurs Week events will be announced very soon – stay tuned!